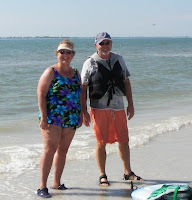 Yesterday Bill and Warren (my brother-in-law) went for a kayak ride while Beth and I took a nice walk along Fort Myers Beach and around Bowditch Point Regional Park. Along the way Beth spotted this starfish in the water. 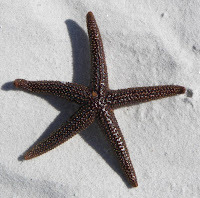 It is illegal to collect live shells, starfish or sand dollars, but this one had already passed so I brought it home. Beth says it will smell badly - so I left it outside to dry out. This gull (or is it a tern?) was having lunch. 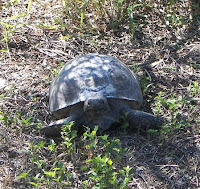 Gopher Tortoises are a species of "special concern" that live in Bowditch Park. This cute little guy took a break from his lunch to pose for his picture. 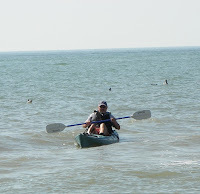 Here is Bill heading back from his kayak ride with Warren. 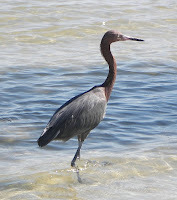 They were gone a couple of hours rowing around the island and into the canals. Warren & Bill are both in excellent shape - but I think Bill will be a little sore from the hard rowing. 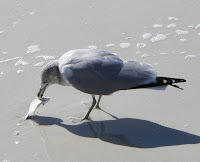 This fisherman is cleaning his catch of the day. Notice all the birds waiting for a handout! After our day in the sun, Beth and Warren came over to our house for a semi-homemade dinner. We had a great day!